"You ought never to be allowed in the theater again!" When one thinks of Fred Astaire, one naturally thinks of Ginger Rogers as his dancing partner. And so it was for many years while they were featured players at RKO. But in 1939 Astaire's RKO contract came to an end, freeing him to work for other studios, including MGM, already the home of many great musicals by that date. One of the stalwarts of the MGM system was the Queen of Tap herself, Eleanor Powell. It was a natural for the studio to pair Astaire with Powell for this film, the latest entry in their long-running series, and the result is a tap lover's fondest dream. Johnny Brett (Astaire) and King Shaw (George Murphy) are a hoofing team that has fallen on hard times as they dodge bill collectors. After promoter Bob Casey (Frank Morgan) sees Brett dance, he wants to sign him. But thinking Casey is a collection agent, Brett pretends to be Shaw. The promoter thus arranges to have King Shaw signed to a show starring Clare Bennett (Powell), discovering only too late that he's got the wrong dancer. Complicating matters, Shaw has an incipient drinking problem, and complicating matters further, both Shaw and Brett fall in love with Clare, testing their friendship and loyalties to the brink. In support of the dancing are over half a dozen new tunes written for the film by Cole Porter. The songs are, oddly enough for Porter, one of the weakest aspects of the film. Of course the finale, featuring the revived tune Begin the Beguine (already at this point a hit for Artie Shaw), is justly famous, and not only for the astonishing dancing of Powell and Astaire. It's an amazing production number in its own right, and the fact that it's set to a classic composition just makes it all that much more the sweeter. I Concentrate on You is in the second tier of Porter's hefty songbook, but most of the rest of the tunes, such as Please Don't Monkey with Broadway and I Am the Captain are eminently forgettable. The arrangements by Alfred Newman tend to get a little drippy at times, which doesn't help matters. But this picture is really all about dancing, and the music works well enough as a tableau for the fancy footwork of the three stars. Astaire isn't stretched much at all here, essentially playing himself. Powell demonstrates that she was able to sing as well as dance, and she presents a fun and spunky character that more than holds her own opposite Astaire. MGM contract player George Murphy is nothing more than okay in his supporting role, with a rather exaggerated drunk act being the highlight of his performance. But he dances quite well indeed and thus plenty of shortcomings in the area of drama can be forgiven in such a piece. Frank Morgan is as always a delight, making the most of a rather small role. There's a fair amount of filler, such as an extended juggling sequence featuring Trixie Firschke, which really comes out of nowhere, and goes nowhere as well. 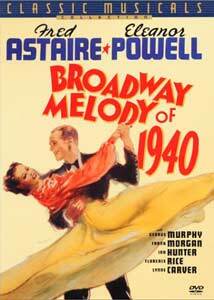 This was the fourth and last of MGM's Broadway Melody series, the last three of which all featured Powell. The stage melodrama devices were already worn quite thin by the time this entry rolled around, it was probably time to pull the plug on the series. But this definitely makes for a fun sendoff that will have you looking for your tap shoes. Image Transfer Review: The original full-frame picture looks surprisingly nice for a film of this vintage. The picture was shot in black & white due to concerns about shrinking audiences during the onrushing war, but the presentation is nonetheless quite attractive in monochrome. The main issue is a persistent flicker in the backgrounds, but that's not terribly surprising for a film over 60 years old. It's otherwise in very nice condition, with only minor speckling and no serious picture defects. The film's rather grainy, but the picture is nicely detailed and has deep black levels and very good greyscales. Shadow detail is excellent. Audio Transfer Review: The sole audio track is the original 1.0 mono. The sound is nicely cleaned up, with only nominal hiss and noise present. Dialogue is quite clear throughout, and the music sounds fine, though predictably lacking a bit in presence. There's little low bass to be heard, but there is no shrill character such as one often hears in audio tracks from this period. By comparison to the audio on the trailer, this sounds terrific. Extras Review: Although not a full-fledged special edition, this disc does include some interesting extra material. Foremost is a brief segment on Cole Porter in Hollywood, concentrating on this film, hosted by veteran dancer Ann Miller. Although just under ten minutes in length, the featurette provides background on the series, Astaire and Powell, and how the various dance sequences (especially the finale) were performed and filmed. In support is a one-reel short (10m:34s) from the Our Gang series, The Big Premiere. This short comes from 1940, and thus might have actually played in support of the feature, making it a nice addition even for those of us who don't much like this series of comedies. There's a predictable amount of racial humor (which some may find offensive, though it's not too mean-spirited) that's directed at Buckwheat. The short features the gang getting thrown out of a big Hollywood premiere for disrupting the cement footprint ceremony; the solution is to make their own film and hold their own premiere for the neighborhood kids. Of course, mayhem ensues and Buckwheat gets stuck in the cement. Since the series does have many fans, and these films don't seem to be on the horizon for a DVD issue, this will be a welcome treat for many viewers. Wrapping up the package are the original 1940 trailer in surprisingly good condition and a brief set of production notes. This is a disc that belongs in the collection of anyone who loves dance, particularly tap dancing. The transfer is quite clean and pleasant, and there are a couple of useful extras to boot. The package is worth the price just for the Begin the Beguine finale.